To me nothing represents the joy of spring-time like butterflies. With spring approaching I am looking forward to my second field-season studying the pearl-bordered fritillary butterfly. The pearl-bordered fritillary gets it’s Latin name, Boloria euphrosyne, from the Greek goddess Euphrosyne, who represents joy. It is indeed a fitting name for this butterfly which is the earliest of the fritillary family to emerge in the spring. 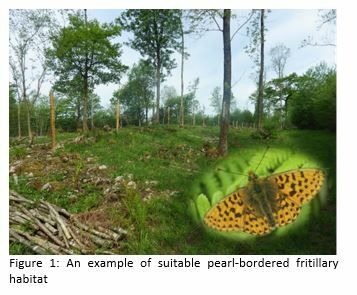 The pearl-bordered fritillary favours early-successional habitats, such as those created by coppicing. It’s habit of following the course of woodsmen and colonising newly created woodland clearings, earnt it the colloquial name of ‘Woodman’s Friend.’ Sadly, changing agricultural practice and declines in traditional land management have seen many populations die out as suitable habitat has been lost. This butterfly is now one of Britain’s rarest and only persists in fragments of semi-natural habitat, but historical Lepidoptera collections bare evidence to their once widespread distribution. Historical collections provide a valuable resource for research and can be used to help us understand current populations better. As part of my project I’ve been comparing historical fritillary specimens from Tullie House Museum and the Natural History Museum database to current populations in north-Lancashire and south-Cumbria. I’m using wing morphology to infer changes in butterfly mobility in response to habitat fragmentation. Population mobility is an important consideration in conservation; dispersal determines species’ survival in fragmented landscapes, and influences processes such as local adaptation, community dynamics and population genetic structure. My initial analysis shows differences in several morphological traits, including thorax volume and wing size, between current and historical specimens. This suggests that dispersal capacity may have changed over time and my fieldwork this year will building upon these results. Part of my fieldwork this season involves trying to catch live aphids on lettuce from various parts of the UK. I would provide you with ~30 lettuces to grow in your garden and I would ask if you see any aphids on the lettuce for them to be sent to me at Rothamsted Research. Costs for postage etc. would be paid for and you will also get a summer’s-worth of free lettuce to eat! This will not require anything other than keeping the lettuce alive and checking them for aphids when you pick one 😊. If you are not interested but may know someone who could be, please send this on to them. Please email me for further details: dion.garrett@rothamsted.ac.uk. It’s that time of year again where many are recovering from over indulgent festivities and making new year’s resolutions; to run 10km, eat healthier, learn a new skill, save more money, publish a paper in a journal, procrastinating less and being more focused – to name a few. If you have a new year’s resolution or not, most of us have had a moment of reflection and deliberation; fleeting or enjoyably reminiscent. I have used some of my time away from work to contemplate and reflect on both the positives and negatives of what has come to pass during 2018. Personally, I am not someone who readily makes these types of resolutions or goals as I feel these generally fall by the wayside, usually due to busy schedules! I prefer long goals moreover the short ones, perhaps this is one of the reasons why I am doing a 4-year PhD; it’s not so much about the brief unsustainable gains but the long-term ones. Moderation and mind-set are big players and having retrospective helps keep me on track to achieve these long-term goals. I thought it a fitting point in my PhD project to reflect on my own progress and how I am set for what 2019 has in store. 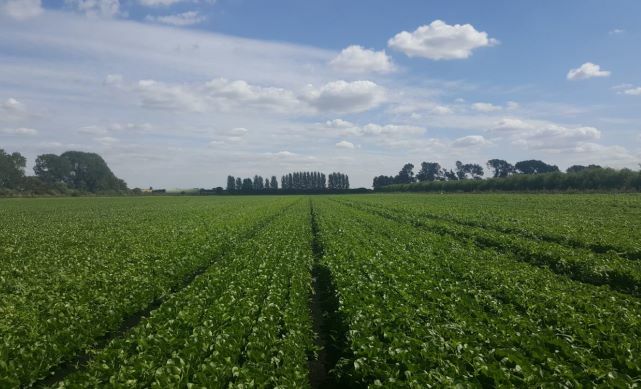 Firstly, if I haven’t met you or managed to pull your ear off about my project before, I am a second year PhD student at Rothamsted Research researching into methods to control a serious insect pest of lettuce crop. The currant-lettuce aphid (Nasonovia ribisnigri) is the most damaging species to lettuce in the UK and parts of Europe (Diaz et al. 2012). Currently there is little control for this pest due to its preference to infest the centre of the lettuce, rendering foliar sprays ineffective (Fig. 1B) (Natwick & Lopez, 2016). This pest is caught in very low numbers with existing trapping methods, which make predicting when they are likely to move from their primary host (currants (Ribes spp.)) to their secondary host (lettuce). Resistant lettuce varieties were introduced in the late 1980’s and provided close to full resistance against the aphid. However, resistance breakdown was first reported in 2007, with resistant cultivars now having little effect against the currant-lettuce aphid (Broeke et al. 2013). Figure 1: A) A lettuce field at my industry partner, G’s, where an outbreak of currant-lettuce was detected. B) The centre of a little gem lettuce with many nymph and adult currant-lettuce aphids. I aim to create a more accurate and robust forecasting model to predict migration from the primary host to secondary lettuce host; where this species becomes an agricultural problem. This will be achieved through insect trap optimisation, field margin surveys, phenological data analysis and overwintering studies. By using molecular tools, I want to obtain whole genome sequences of both resistant and susceptible biotypes (against the resistant lettuce cultivars) and identify where the resistance is located within the genome. Providing this is attainable, I hope to geographically map these resistant biotypes which will inform me on the spread and evolution of resistance over time using the currant-lettuce aphids caught in the Rothamsted Insect Survey (RIS) archive from 2003-present. I have been working with my CASE Project Partner, G’s, on their Cambridgeshire site. This year I set out to identify the best method for capturing this elusive aphid. 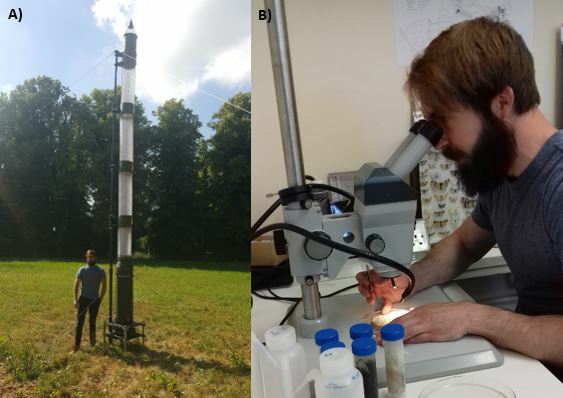 I incorporated a variety of insect traps throughout March-September and sampled twice a week, with all aphids identified to species level and other insects to order. This was quite an intensive schedule and I don’t think I really understood the amount of work involved to successfully complete it. Travelling and sample collection took a big chunk of my time but this was overshadowed by the time needed to count and identify all the insects in my traps. I did manage to find that one of my traps (pop-up suction trap (Fig. 2A)) by far was the most robust at catching high numbers of aphids; and I even caught a few of my species of interest too! Figure 2: A) Me demonstrating the size of 6m mobile pop-up suction trap. B) Identifying aphids and other insects caught this year from the samples collected from my industry partner. I’ve got previous taxonomic skills, primarily developed from my MSc Entomology course at Harper Adams University, but I additionally gained a pretty good grasp from spending tireless hours in the countryside hunting bugs and identifying them as a child. It was a steep learning curve to be able to be competent enough to identify aphids however. In the UK there are over 600 species of aphids, with over 400 being caught in the Rothamsted Suction Trap Network (Fig. 2B). Aphids are on another level of confusing but I persevered and I can happily say that I feel confident at identifying the main aphid pest species now. With access to the Rothamsted Insect archive of the suction trap network, I have gone through all the aphid samples from 2003-present and collected all the currant-lettuce aphids that were caught during this time. To put it in perspective, some of the samples was like looking for an aphid in a stack-full of aphids, which to the untrained aphid-spotting eye, all look incredibly similar… (Fig. 3). I now have ~500 samples now readily waiting in the freezer to be analysed! Figure 3: A) A currant-lettuce aphid (N. ribisnigri) under the microscope. B) A typical sample of aphids collected from the pop-up suction trap. C) Once the aphids are identified and counted, they are put into a glass vial for long-term storage. On the molecular biology side, I have been provided some currant-lettuce aphid colonies from Warwick University Insectary at their Wellesbourne site of both resistant and susceptible biotypes. I have reared my own colonies out of these and generated isogenic (clone) lines. It took some time to identify the best method for DNA extraction for whole-genome sequencing (WGS) but this is now complete and extraction/sequencing is underway. My first year of the PhD has completely flown by (similar to most I’m sure!) with both field and laboratory work taking the largest chuck of my time. The remainder has been filled with reports, conferences and a plethora of training courses such as statistics (introduction to advanced courses), bioinformatics to presentation skills and courses in personality types/traits (very helpful!). I can now satisfactorily say, I have done my fair share. Although extremely valuable, these training courses, conferences, meetings did take a lot of time and took me away from my actual project. If I had my time again, I would schedule more effectively and prioritise the more pressing skills workshops etc. to the relevance of my project. Doing a project such as this as been eye-opening in more ways than I thought. Working at Rothamsted Research is a great experience, with a strong PhD student community and working alongside like-minded people; I don’t think I could be in a better place. On reflection since starting this PhD, I have laid a good foundation for my project and feel like I am making some positive progression. This year is going to be difficult but I feel that I now know the direction I want to take the project and approaching this year with an optimistic mind-set. If you would like to contact me to discuss anything mentioned in this blog, entomology-related or otherwise please feel free to drop me an email too (as above). Broeke, C.J., Dicke, M. and van Loon, J.J., 2013. Performance and feeding behaviour of two biotypes of the black currant-lettuce aphid, Nasonovia ribisnigri, on resistant and susceptible Lactuca sativa near-isogenic lines. 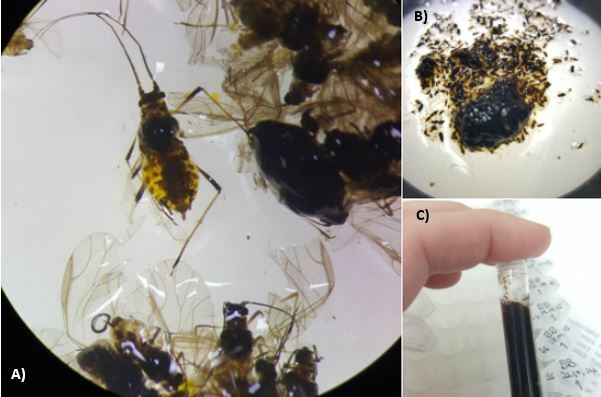 Bulletin of entomological research, 103(5), pp.511-521. Diaz, B.M., Barrios, L. and Fereres, A., 2012. Interplant movement and spatial distribution of alate and apterous morphs of Nasonovia ribisnigri (Homoptera: Aphididae) on lettuce. Bulletin of entomological research, 102(4), pp.406-414. Natwick, E.T. and Lopez, M.I., 2016. Insecticide Efficacy Against Aphids in Leaf Lettuce, 2015. Arthropod Management Tests, 41(1). So, the early American tribes saved them from extinction, but how did avocados escape the New World and become a familiar addition to the modern diet worldwide? For its introduction to Europe, the fruit was first described in a 1526 book by Martin Fernandez De Encisco.3 This was an important step in turning a tropical novelty into the modern commercial crop we recognise today, but the full process would take years of careful breeding…and some luck. Tree breeding in general is a time consuming process, given the nature of the organism, but avocados in particular add an extra layer of challenge into the mix with their unique sexuality. Like many plants, the avocado tree prevents self-pollination of its own flowers. However, instead of simply separating male and female flowers, the avocado flowers have both sets of sexual organs, and expose them separately depending on the time of day. For a ‘Type A’ tree, the female sexual organs open in the morning, while the male parts stay retracted and do not shed pollen. The female parts then shrivel and die, while the male parts emerge the next afternoon and shed pollen.2 A ‘Type B’ tree opens its female parts in the afternoon and its male parts the next morning. Performing cross pollinations by hand is naturally very difficult for this tree. Breeders often just plant suitable trees within close proximity and hope for the best. The consistent flavour produced by grafting is great for consumers, but poses a challenge for the fate of avocados. All commercial cultivars are genetically identical, and grafted onto disease-resistant rootstock when creating a new commercial tree. 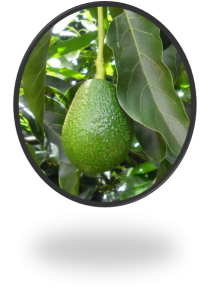 To bring about real genetic change in the avocado industry, it will take more trials, many years, and some luck to take the next step forward. Also, breeding must focus on more than just superior flavour and marketability. A sustainable industry requires trees which use less water, hearty and disease resistant rootstock, and varieties that can face the more demanding climate challenges of our changing world. The trend toward better environmental stewardship will ensure the most economical and highest quality fruit can be grown all over the world. The expectations are high, but for a tree that emerged as a result of so many little miracles, it only needs a chance. “” Avocados From Mexico, avocadosfrommexico.com/avocados/history/. “Growing Avocados: Flowering, Pollination and Fruit Set.” Agriculture and Food, Government of Western Australia, www.agric.wa.gov.au/spring/growing-avocados-flowering-pollination-and-fruit-set. “The Origin Of Avocado: A Brief And Interesting History.” CureJoy, 13 Apr. 2018, www.curejoy.com/content/avocado-origin/. Lancaster University covered an article of the Waitrose CTP induction event collaboration with CGE. Waitrose CTP welcomed its second cohort of students last month. The students travelled from their home institutes to Lancaster Environment Centre at Lancaster University for the 2 day welcome Event. 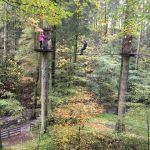 During the event the students and supervisors participated in a series of activities including introductions from CTP academic director and Alan Wilson from Waitrose, plus cohort team building activity in Grizedale Forest. Dr Carly Stevens, the Waitrose CTP academic director, introduced the programme before handing over to the students. 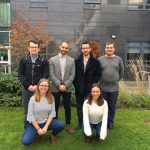 The students impressed the CTP board with their knowledge and enthusiasm of their projects with only two weeks work into their PhD programme. The agenda for day two involved the students getting to know each other. 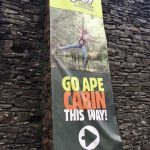 The students conquered their fears and had fun climbing and swinging high from the tree top adventure at Go Ape in Grizedale Forest.